High performing healthcare organizations depend on a well-educated, and engaged nurse workforce to deliver evidence-based care that meets increasingly strict patient safety and quality guidelines. Yet, many still struggle to attract and connect with nurses in ways that motivate them to truly be a part of the organization. Standardized education and strong frontline leaders help hospitals overcome top nursing challenges. High-performing healthcare organizations depend on a well-educated, engaged nurse workforce to deliver evidence-based care that meets increasingly strict patient safety and quality guidelines. Yet, many still struggle to attract and connect with nurses in ways that motivate them to truly be a part of the organization. “One of the top challenges for improving engagement, retention, and recruitment is creating and sustaining a culture that empowers nurses to practice clinical excellence,” says Tammy Purcell, MSN, RNC-OB, clinical nurse executive at Elsevier. Organizations that excel at engaging and retaining nurses understand and address what drives nurses, both personally and professionally. “They consistently create a stimulating, supportive, and professional work environment while helping nurses build a successful career path,” says Purcell. Achieving these goals requires hospitals to use a variety of resources and tactics. In our recent research, respondents indicated two key tactics: standardizing evidence-based education and competency management, while developing strong frontline nurse leaders. A recent HealthLeaders Buzz Survey polled 129 senior executives and clinical leaders, asking how nurse education and leadership development are helping them build an engaged nurse workforce. Survey respondents say overall, evidence-based continuing education and strong frontline nurse leaders play critical roles in improving nurse engagement, recruitment, and retention. When nurse leaders create the right environment and department culture in which nurses wait in line for a job opening, we could begin to see significant changes in nurse retention and recruitment. 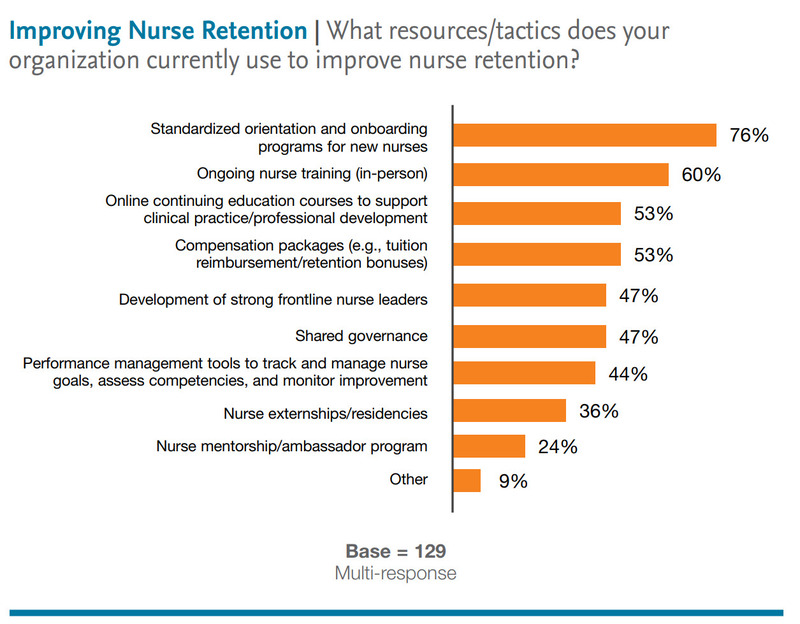 Respondents say they are deploying several tactics to improve nurse retention, including offering the following: standardized orientation and onboarding programs for new nurses (76%), in-person ongoing nurse education (60%), online continuing education (53%), and compensation packages (53%). Additionally, close to half say they are developing strong frontline leaders to grow retention. Notably, compensation packages rank lower than standardized orientation and onboarding programs, as well as in-person education, when it comes to retaining nurses. Mason says providing evidence-based education at the point of care has led to powerful results at CHI, including strengthening nurse and patient engagement. “It allows nurses to show that they are using the most current evidence as they work with their patients,” she says. “It also has a downstream effect of improving patient quality and outcomes.” Mason points to a recent situation involving a new nurse at a CHI critical access hospital who was struggling to perform a patient procedure. The nurse was working the night shift and needed to perform a procedure she was checked off as competent in, but had not actually done before on a patient. “She was able to pull up our online skills and procedures resource, watch a demonstration video, read through the procedure, and then perform that procedure with confidence and a good outcome,” says Mason. 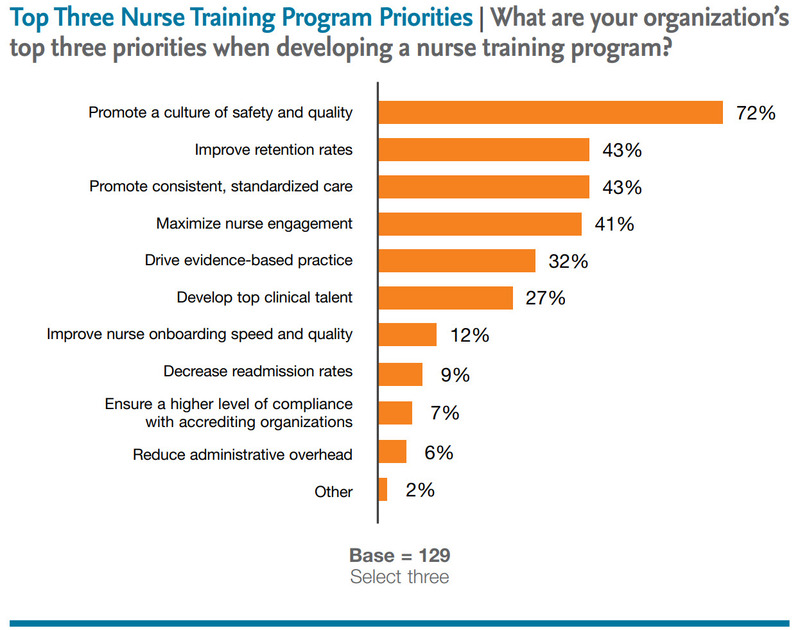 According to the buzz survey, respondents say their top nurse education program priorities include promoting a culture of safety and quality (72%), improving retention rates (43%), promoting consistent, standardized care (43%), and maximizing nurse engagement (41%). “It is no surprise that the top priority of nurse education programs is to promote a culture of safety and quality,” says Purcell. These are evergreen areas healthcare organizations are constantly seeking to improve. “Improving retention rates and maximizing nurse engagement could support these efforts,” she adds. 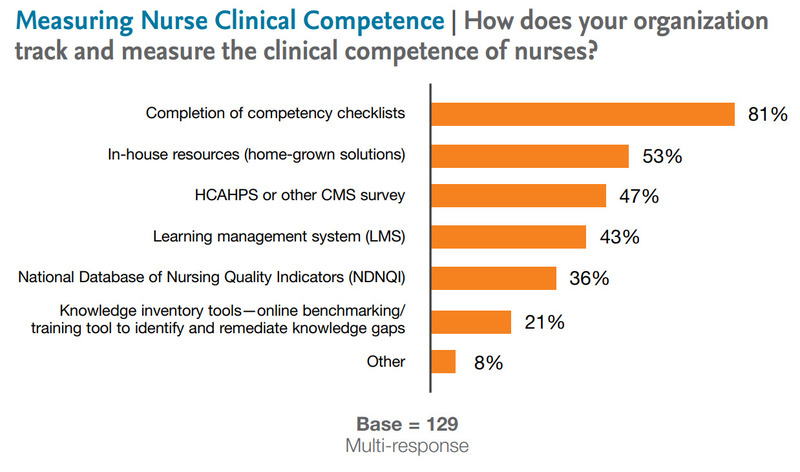 When it comes to tracking and measuring nurse clinical competence, respondents say they use several resources, including competency checklists (81%), in-house resources (53%), HCAHPS or another CMS survey (47%), and a learning management system (43%). Purcell agrees that competency checklists are one of the most valuable tools used in measuring nurse competence. “It is a single source of truth for a specific competency. When used with a learning management system, competency checklists become an even more powerful way to measure nurse clinical competency and assign remediation,” she observes. While education sets the foundation for a successful nursing program, strong, proactive frontline nurse leaders play important roles as well. The HealthLeaders Media 2017 report Nursing Excellence: Leadership Development, Culture, and Retention identified nurse retention, recruitment, and engagement as the top three nursing challenges and concluded, “Without strong frontline leaders, many retention tactics will be difficult to implement and sustain.” Purcell concurs. “When nurse leaders create the right environment and department culture in which nurses wait in line for an opening, we could begin to see significant changes in nurse retention and recruitment,” she says. 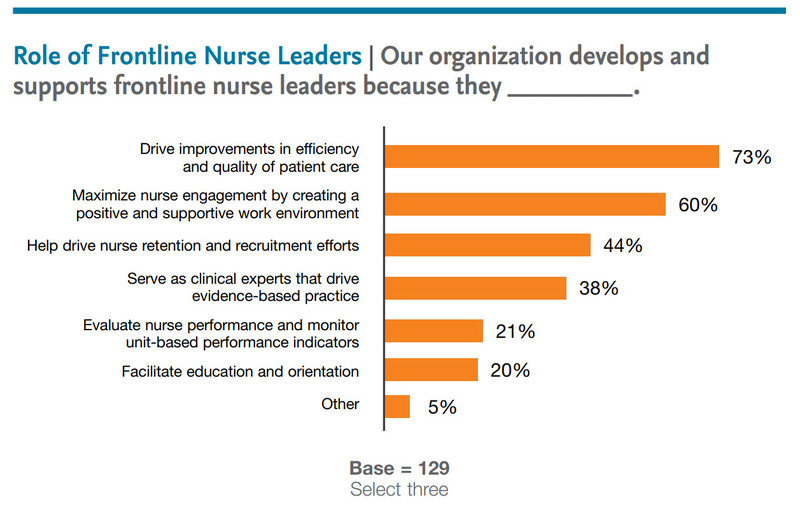 Healthcare leaders say their main reasons for developing and supporting frontline leaders include improving efficiency and quality of patient care (73%), maximizing nurse engagement (60%), driving retention and recruitment (44%), and having clinical experts who will drive evidence-based practice (38%). While Baby Boomers are more likely to stick around in hopes that things might change, millennials most definitely will leave. Purcell says frontline nurse leaders should model behaviors that show their passion for nursing, including promoting clinician improvement; advocating for standardized, evidence-based care across the continuum; and driving patient safety and quality outcomes. “They need to be open communicators who are unafraid to question the status quo,” she says. Nurse leaders also must be astute in engaging new nurses, especially millennials, who comprise a growing percentage of the nurse workforce, says Mason with CHI. Millennial job satisfaction differs from that of other generations. They want a stronger work-life balance, a well-structured orientation, involvement in decision-making, and engagement in change processes. “While Baby Boomers are more likely to stick around in hopes that things might change, millennials most definitely will leave,” says Mason. Purcell says it is critical to support frontline nurse leaders through evidence-based online continuing education. “Without it, we risk veering off track and simply educating others the way it has ‘always been done,’ regardless of where that methodology came from, rather than basing our education and actions on what the evidence proves is best.” This approach also ensures new nurse leaders are creating a standardized foundation of knowledge based on research. Nurse leader development programs should also include both classroom and independent learning opportunities, says Purcell. Development opportunities such as robust tuition reimbursement for advanced degrees, shadowing with experienced clinical leaders, nurse leadership conferences, and outside networking opportunities can all be used to help groom frontline nurse leaders as well. A learning management system combined with online leadership and professional development courses is also important in helping a direct care nurse advance into a leadership role. Learning management systems make it easy for organizations to deploy continuing education courses to effectively orient, educate, and develop specific competencies for new nurse leaders, while tracking and identifying knowledge gaps.